In 2011 Daegu hosted the World Championships for athletics, and while all attention was focused on Usain Bolt’s false start, Mo Farah’s 5k silver and 10k gold, the IAAF held its annual meeting. As with all sports governing bodies, a large part of the IAAF’s annual meeting is dedicated to refining the rule book. But in rewriting the rule book the IAAF is rewriting history by annulling one of running’s greatest world records. 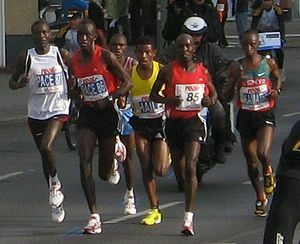 The rule change concerns the use of male pacers in women’s races, and in short means that only when a race is completed in single-gender conditions can it be declared a world record. If a woman were to use male pacers and break the world record, it becomes a ‘world best’ performance. As a consequence of this, Paula Radcliffe’s incredible 2003 London Marathon finish in 2:15:25 is no longer a world record. Instead, the world record stays with Paula, but for her 2005 London Marathon time of 2:17:42. Paula Radcliffe wrote about the pacers she ran with in 2003 in her book Paula. Since the book was revised in 2005 – a good six years before this rule change – perhaps it can shed some light on how male (specifically male) pacers affected her race? At the Isle of Dogs one of the Kenyans began to struggle and his bad moment came at a time when I wanted to push on. He was dropped and I saw it more as a rival being cut adrift than a pacemaker being lost. […] The last 800m were great because the density of the density of the crowd and the volume of the noise rush you on to the finish line. I was also racing Christopher all the way to the finish too, and though he had to follow the blue men’s finish line and I the green women’s one, I remember being genuinely annoyed that he beat me and finished half a second ahead of me. The clock stopped at 2.15.25, almost 2 minutes faster than my Chicago record, my last mile covered in under 5 minutes. That confirmed my feeling that the windy conditions and the arrival of my period in Chicago had taken their toll on my performance. In my eyes, it was a fair reflection of the form I was in and how hard I had worked. Led by pacemakers, Gebrselassie was on course for the world record throughout. He went through halfway in 62:29 minutes. His rivals couldn’t match that kind of pace from the very start, and Gebrselassie was in a race of his own through the streets of Berlin. Through 30 kilometers, two of the original five pacemakers were able to stay with him. But then both Eshetu Wondimu (Ethiopia) and Rodgers Rop (Kenya), the latter winner of this year’s Hamburg marathon in 2:07:32 and a former champion in New York and Boston, dropped out. And doesn’t that just say it all? In order to be the fastest in the world you need to be faster than everyone else and maintain a pace that no one else is capable of. Roger Bannister, the first man to break the 4-minute mile, used several pacemakers who dropped in and out of the race to keep the pace up because at that point he was the only man at that race meeting ready to break the world record. The fact of the matter is that Paula Radcliffe went through the first 13.1 miles of the 2003 London Marathon in 68:02, which was faster than any woman had run a half-marathon in the previous year. If no other athletes in your gender are capable of running at your pace for half the distance you’re racing, what’s the point of having a same-gender pacemaker? Paula Radcliffe is a rare athlete, and the fact that no other woman has run within two minutes of her best ever marathon time speaks volumes. The IAAF’s decision has been publicly criticised by the World Marathon Majors and Association of International Marathons and will be directly queried by Dave Bedford, the Race Director of the London Marathon. However, given that the IAAF stuck to its guns on the one-false-start-and-you’re-disqualified ruling even in the face of Usain Bolt, it’s unlikely that they will shift on this issue. But then isn’t the real issue at hand here that the IAAF, through setting this rule, is holding back the ambitions of female athletes? Will the gap between elite men and women’s times just continue to grow as women are discouraged from taking on the big boys? Cast your vote over at the Foot4ward Facebook page.